← James Blake Viewed in the Past Tense Except By His Fans. Pennetta Upsets Stosur While Kuznetsova Makes First Semi of Year. Flavia Pennetta After Entering Mercury Insurance Open Semifinals. The Mercury Insurance Open down in San Diego has certainly not gone according to form, at least by the draw which has now seen the top two seeds bow out early while some veteran and young players have made themselves heard. And while an arm injury is a new cause for concern for Sam Stosur, it’s the return of Russian Svetlana Kuznetsova to a semifinal for the first time this year that’s made the biggest news so far today. Flavia Pennetta continued her now 3-0 winning streak against Stosur with a convincing 6-3, 6-4 quarterfinal victory. Pennetta never looked rushed by Stosur’s massive forehand or when the Australian would serve and volley. Instead it was Stosur who looked frustrated the whole match at not being able to find a way into the Pennetta service games along with her now trademark kick serve that didn’t seem to bother Penetta at all. In her press conference, Stosur was asked about her shoulder that’s been lightly taped in several matches now. Stosur answered that she’s not dealing with a shoulder injury but instead a lower arm issue that she’s still not sure what the cause is. “It’s like a strong ache once it starts and I can’t get rid of it until once I get off of the court. We’ve haven’t been totally been able to figure it out yet.” Stosur, who’s had one MRI already and plans to have another before leaving San Diego, said the pain doesn’t affect any particular shot and that it’s “definitely not a muscle tear”. Pennetta will now take on veteran Svetlana Kuznetsova who took out the American sensation 18-year-old Coco Vandeweghe 7-5, 6-2. Vandeweghe, who took an early break, jumped out to a 5-2 lead, but seemed to let nerves and the fact that she was a bit tired from her previous win last night against Vera Zvonareva to allow Kuznetsova to claw back into the match. Vandeweghe, who held a set point against Kuznetsova’s serve at 3-5, lost that game and then hit four double faults to let Kuznetsova back in at 5-4. The Russian held serve for 5-5 and by then it was Kuznetsova who was winning most of the rallies while Vandeweghe’s backhand broke down. Kuznetsova After Making First Tour Semifinal in 2010. After Kuznetsova took the first set 7-5, she started directing more shots to Vandeweghe’s backhand. Kuznetsova jumped out to a 4-1 lead after breaking Vandeweghe twice and by then it was the Russian’s match to lose. She didn’t though as she served it out after another Vandeweghe backhand went long on the second match point. I’m disappointed that Vandeweghe lost that match against Kuznetsova in straight sets. At the same time, the young American played very well in her young career to take out Zvonareva. I hope to see more of her in the coming weeks. 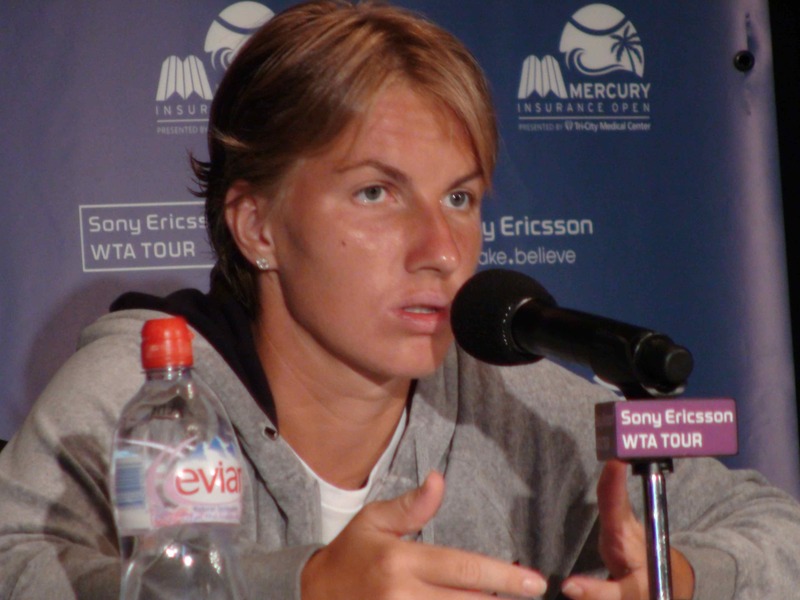 As for Kuznetsova, she needs to continue getting her act together. Otherwise, she could find herself ranked outside the top 20 at the year’s end for the first time in seven years.